A zombie virus has broken out in Ireland. One particular family, the Murphys, whose son Billy was the first to be affected by the virus will do anything to protect him from their angry neighbours baying for blood and wanting him destroyed. His mother is determined that he is still in there somewhere and is keeping him in the family home muzzled and tied to his bed in the hope that one day he will stop trying to eat them and return to normal. To help them in their plight to protect Billy they have invited an American film crew into their home to make a documentary to bring to light the daily struggle of caring for a zombie and highlight the epidemic unfolding across the country. 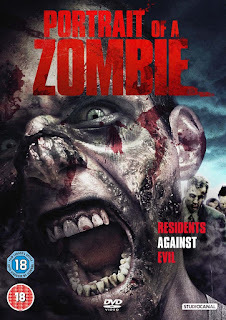 This is very low budget and almost all the production crew feature as part of the cast as well so some of the acting isn't great but its a brilliant concept and is emotive, humorous and gory in equal measures. In a lot of ways it reminds me of the fantastic late 90's/early 00's low budget zombie gems I, ZOMBIE and COLIN which I rate amongst my all time favourites so watching this made me extremely happy and restored my faith in modern zombie movies. The characters are mostly typically Irish in everything they do from their matter of fact way of dealing with the undead and their fierceness in protecting their families. The American film makers are suitably characteristic and although most of them mean well they don't do an awful lot to help the family. Stand out parts for me are graphic depictions of devouring unborn babies and a stomach churning yet endearing scene of the mother cutting pieces off herself and feeding them to her zombie son. There is a comedic undertone throughout with great interviews of various towns folk and their opinion on the ZA, scenes of banner toting protestor's and the classic tale of "boy meets girl-boy turns into zombie- girl wants to marry zombie" prompting a highly amusing conversation with the vicar about why he wont marry them coining the phrase "Jesus was not a zombie and Billy is not Jesus"!. The visuals and FX are really rather good considering the budget but it is a tad tainted by CGI. The sound over the dialogue is a bit odd and echoes a fair bit presumably to try and enhance the dramatic effect and the main soundtrack isn't the best but all that is bearable and easily overlooked (in my opinion) by the zombies who are awesome and really give it their all, the make up is OK from a distance, up close its a bit dodgy but I liked it. Movement wise they are the slow shuffling type with the attitude and brutality of the more modern type of zombie. Billy is high up there in my top ten favourite zombies of all time, almost rivalling Colin but not close to beating Bub. This may not appeal to everyone due to its B movie feel but its a massive recommend from me and for a relatively unknown movie has had a lot of positive reviews.